GF Piping Systems' free chlorine analyser. The built-in flow regulator automatically controls the flow stream across the sensors membrane, resulting in reduced bubbles for improved system accuracy, and allows for a wide range of inlet pressures from 15 to 120 psi (1 to 8 bar). The Signet 4630 Free-Chlorine Analyser is designed with amperometric sensing technology for measuring free chlorine. It is suitable for primary/secondary disinfection, water distribution, de-chlorination, algae growth prevention, slime (bio-film) control, and taste and odor control. The 4630 Chlorine Analyser’s amperometric sensor technology provides an improved solution over traditional chlorine monitoring by enabling more accurate measurement in real-time and eliminating the need for reagents, the company says. Typical chlorine measurement devices, such as reagent-based analyzers, rely on chemicals, which may be costly, out-dated, contaminated, and require frequent replacement and maintenance. These also require frequent calibration and cleaning. The instrument also offers the ability to have manual or continuous pH compensation that allows for highly accurate free chlorine readings. 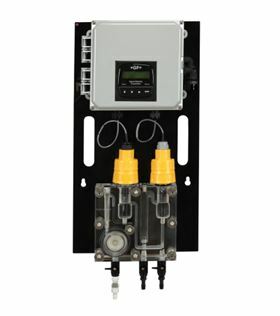 In addition, for troubleshooting purposes, the chlorine sensor also contains diagnostic data that can be accessed through the chlorine instrument. Manufacturer of environmental pumping systems, QED Environmental Systems, has announced the release of the LANDTEC BIOGAS 3000 Fixed Gas Analyzer.